So last time I was on here I talked about how crazy busy my life can be! This is very true. My life can be and often is crazy busy. This can lead to lots of eating on the go, which is not always good for you or your waistline. In a matter of weeks I shall have a big birthday. It is one of those milestone birthdays that bug you when you’re a woman. How old will I be? It involves a ‘3’ and we will leave it at that. I have started paying a lot more attention to what I eat. I am already vegan, but there is a lot of vegan junk food out there. Today’s lunch was crazy healthy and crazy good. 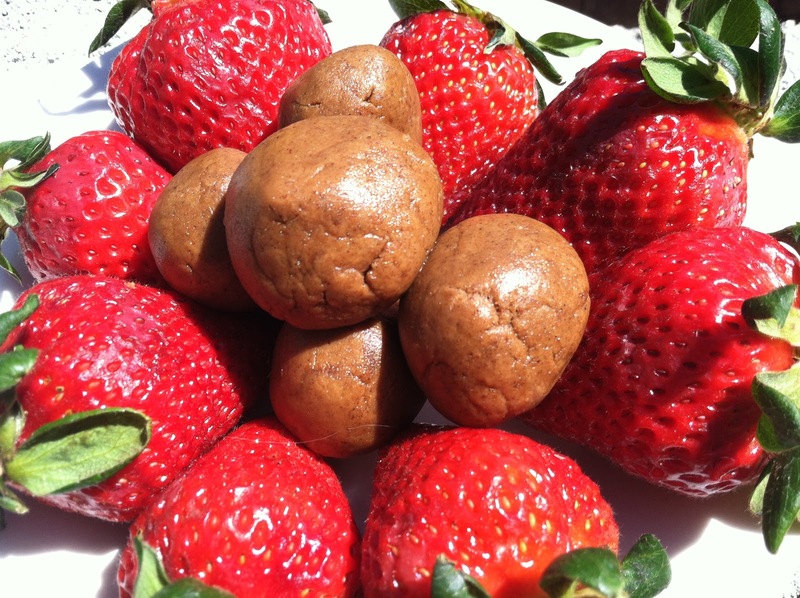 I made flavored peanut butter and rolled it into truffles, or really, I just rolled it into balls. I can throw a few of these into a small container, throw it into my purse and go. That makes these flavored peanut butter balls great travel food. Also, it is amazing to make flavored peanut butter sandwiches. Mix together. Either roll into ball shapes or place in an airtight container and use on sandwiches. For lunch today I ate some of these with a bunch of fresh strawberries. Four hours later I feel full and refreshed. Last night I used this to make some sandwiches with whole grain bread. I smeared this peanut butter on one side, sprinkled the other side with a little agave, and placed slices of fresh gala apple in-between. Kids and adults both in my class loved this recipe and declared they were making it for lunch. Success! So enjoy this recipe for your own busy schedule and grab life by the… peanut butter. P.S. This would also work great with almond butter if you are peanut avoidant.